How do I subscribe to or change my subscription plan? 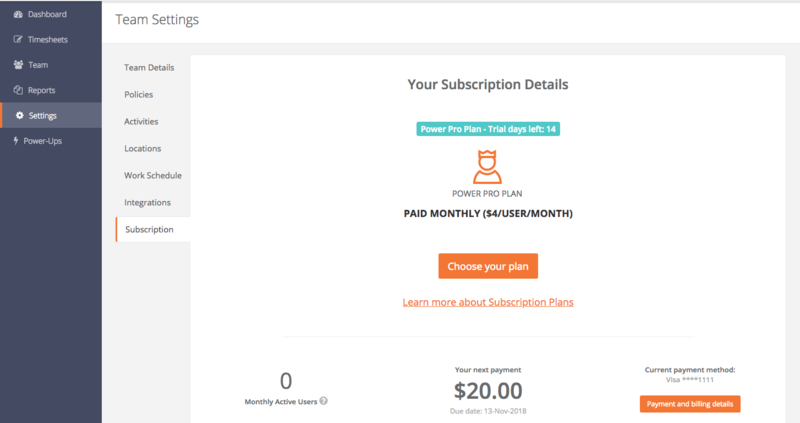 When you signup to Jibble, you are placed on a 14 day free trial of the Monthly Power Pro Plan. If you are happy with this, you can simply set up your billing details (see below) before your trial expires. If you would like to choose a different plan, follow the instructions below. You can read more about our different subscription plans in this article. Click “Payment and billing details”. You will be guided to our payment portal to set up your credit card or PayPal details. At the moment, only credit card and PayPal can be used to make monthly payments. Contact us if your team has over 20 staff and you want to make an annual payment via bank transfer. If you selected an annual plan, you will have to purchase the number of licenses or "seats" for the year (you can always change this). You can read more about that here. That's it! You have selected your plan. You can always upgrade your plan at any time (from basic to power, or from monthly to annual). The changes for an upgrade will take effect immediately. 2. Select "Change your plan"
4. Select the number of licenses that you would like to purchase for the year (you can always add more members later). 5. Click "Purchase" and that's it! You are now on the Power Pro Plan for a year. Note: if you upgrade from a monthly plan to a different monthly plan, you won't have to purchases licenses upfront. You will be charged based on your number of Monthly Active Users instead. 2. Select "Change your plan" and switch to "Monthly"
3. Select Power Lite. 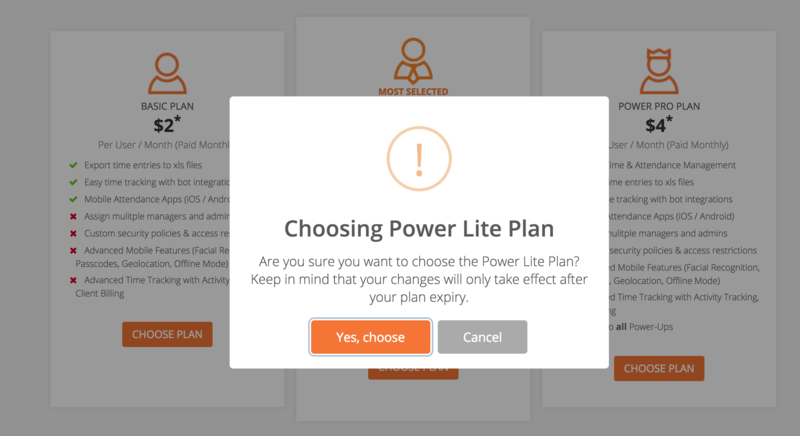 Note that the popup mentions that "the changes will only take effect after your plan expiry". 4. Click "Yes, choose" and that's it! Your change is scheduled at the end of your billing period. You can see it underneath your next payment details. You can cancel the scheduled change by clicking on the link at the bottom of the subscription page. If you downgrade from a monthly to a different monthly Plan, your change will occur at the end of your billing period. 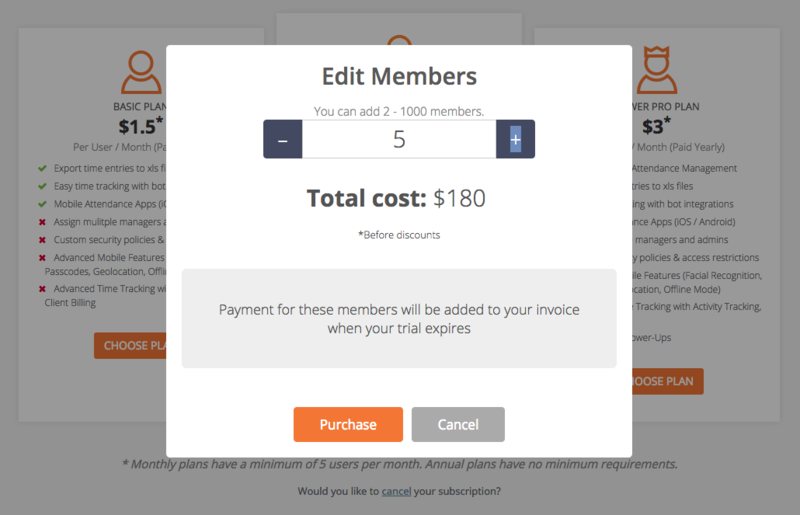 If you are on an annual plan, and you need additional licenses than you can simply purchase these on the subscription page. 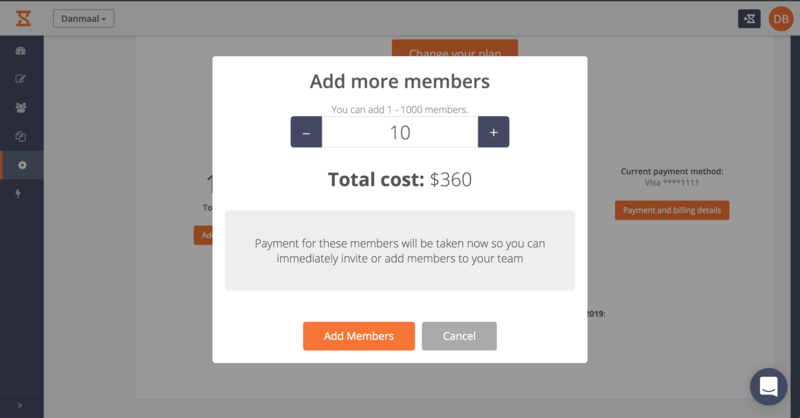 At the bottom left click "Add more members"
Select the number of licenses that you would like to purchase. Note that the total cost will be charged to your card/paypal account immediately. 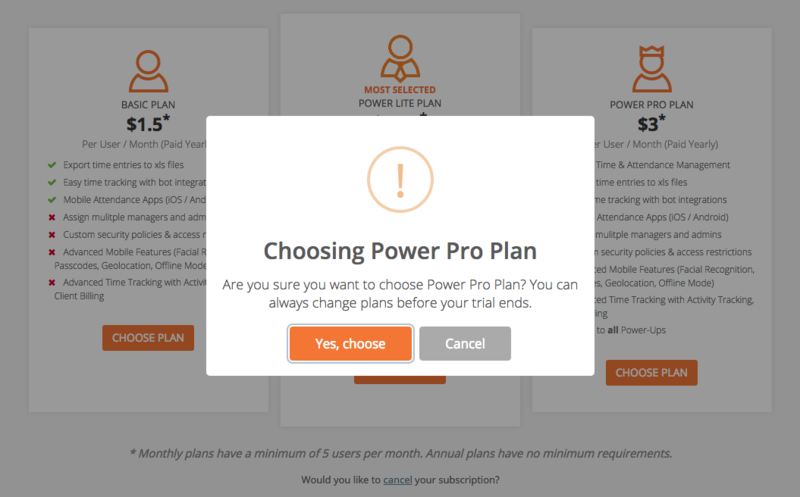 You can cancel your subscription in the same way that you would change your subscription, except instead of selecting a plan, you will need to click the link that says "Would you like to cancel your subscription?". Cancellations are always scheduled. This means that the cancellations will take place at the end of your billing period (month or year).